Here’s another installation in Lark Books senior editor Deborah Morgenthal’s lineup of designer-produced craft books that are aimed to elevate an evening hobby into folk art. Here she has rounded up a talented group of designers and artists for a true showcase of T-shirt art. The designs they have created for The Ultimate T-Shirt Book are impressive and inspirational. For the most part, the instructions to would-be imitators are too, providing basic help on getting started in the textile arts, from batik to screen printing. Morgenthal’s collection falls down, however in its instructions for tie-dying. While she tempts the reader with many fantastic and beautiful shirts, her book fails to give clear how-to advice on creating the many patterns. (Brief instructions for a single design pattern are included. )Given the popularity of tie-dye, that part of the book is bound to disappoint. Featuring irreproducible designs only adds to the frustration. 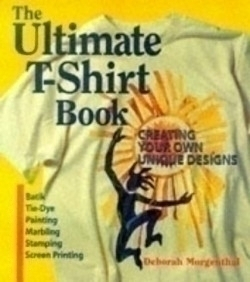 On the other hand, between its soft covers, The Ultimate T-Shirt Book is stuffed with other creative techniques that lend themselves to the first-timer to the seasoned craftsperson. Seriously beautiful shirts are created with potato stamps, paint brushes, markers, and in the case of marbling, pools of paint. Employees of Lark Books model the creations of artists who hail from the deep woods of Tennessee to the concrete canyons of New York. The techniques are straightforward enough for beginners to create wearable art. Meanwhile, the featured designs by professional artists are bound to invoke the creative urges of even the most casual readers. A great book to have handy when the kids get out of school. And why stop atT-shirts? The skills learned here lend themselves to pillows, linens, and custom clothing.